It's a Baker and Johnson, isn't it? I think the date of the Washakie photo is about 1885, though it's usually given as about ten years earlier. I also have no idea if Captain Buck is a white soldier or the nickname given to the Indian leader, as in Captain Jack of the Utes. In the post above, by HinTamaheca, the photo "Washakie and Shoshone Chiefs," the man seated to Washakie's right is "Tigee," rather than "Gigee," as it is labeled. 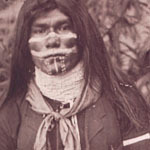 Tigee was a brave Shoshone warrior, and was said to be second in command to Washakie. In the battle of the Rosebud, when Captain Guy V. Henry was shot, it was Washakie and Tigee who were immediately at his side and heroicly fought off the advancing Sioux and Cheyenne, until backup help could arrive to save Captain Henry. Washakie was later presented a beautiful horse and saddle by President Grant for his services to Crook's command during the campaign. Guy V. Henry would later recall, "I felt a sharp sting as of being slapped in the face, and a blinding rush of blook to my head and eyes. A rifle bullet had struck me in the face, under my left eye, passing through the upper part of my mouth, under the nose, and out below the right eye. I retained my saddle for a moment, then dismounted and lay on the ground. The Sioux in their desperate charge actually passed over me and had it not been for Washakie, chief of the Shoshones, fighting over my body; my scalp would have been lifted." And yet, the modern concensus today among researchers on the Crook campaign is that Washakie was not with the scouts who served the Crook command. The back of this cabinet card says. Indian village, Lander Wyoming 1908. Do we know what year it was taken or approximately? 1868 by AJ Russell. At a guess, these are Western Shoshone who have possibly been employed as scouts/guards for the railroad. In other photos taken around the same time, many of the men wear pants rather then leggings, presumably doled out either for the occasion or the job they were doing.